I had asked one of my twitter friends, @Artmaker, to draw a picture of me, and he agreed. 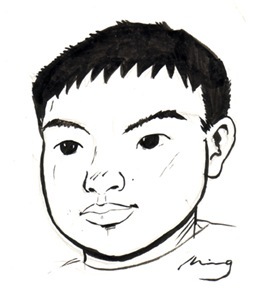 Artmaker (AKA I-Ming) is a cartoonist who is the author of the web comic strip, Fantasy Story. A few weeks later. he emailed me his picture of me, with his signature attached. I think it is nice, so, I decided to draw him a picture of him in return. I drew it with Microsoft Paint as it is not too troublesome because of scanning. I have a touch screen monitor, which makes it easier to draw him at certain points, like the hair and signature. I also used some of the features in Microsoft Paint to help with the drawing, such as the bending lines. 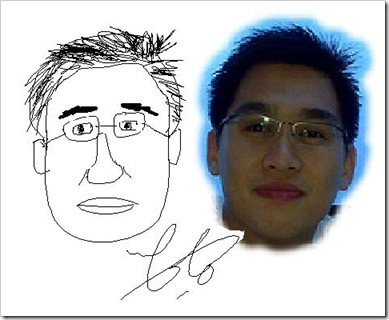 My picture of him, his photo of himself from which I copied from, and my signature. (I used Photoshop to lasso his face. Finally, I drew him. It took about less than an hour, and I sent him my picture, and he said it was great. However, he said he liked the first one better. So, what do you think? Is the first version better, or the second, and why? well the first one seems to be more original since it was the one you first created. both are nice. but he is an excellent artist too. he made a very nice picture of yours! second is great. you really captured his expression and the energy of both face and mouth. as in literature the first draft will most of the time need further revision. I will vote for 2nd picture. Its look 80% similar compare against the actual photo.